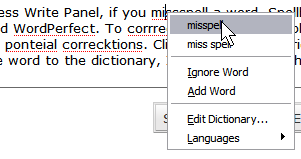 Firefox now features spell check by default in their Internet browser. Misspelled words are highlighted with a red wavy underline, similar to word processing programs. Right click on the highlighted word and choose from the correct spelling in the right click menu. It’s not perfect, and the misspelled word isn’t recognized until after you hit the spacebar or punctuation, but it’s a great step in the right direction. This also eliminates adding on spell checking features to your browser. Okay, so I don’t do titles in caps very often, but this is very deserving. Yes, my husband might have to take second place now that I’ve found true happiness. Well, at least true happiness online. First of all, those of you using Internet Explorer – nah nah nah nah nah! Second of all, those of you using Firefox, you may join me in the applause for Spellbound, the online browser spell checker that will spell check anything you write in any form on any page, including your WordPress Write Panel. Yep, this is how to easily add spell check to WordPress. Just install the Firefox Extension, and then restart Firefox and run the Extension Updates to make sure you have the latest model. If you do, go on and enjoy. If not, install the update and restart Firefox and you are ready to enjoy. As you write in any form box, like WordPress Write Panel or any blog comments, if you misspell a word, Spellbound highlights it with a red dotted underline, similar to Word and WordPerfect. To correct the spelling, simply click on the red underlined word and a menu pops up with potential corrections. Click the one that is right and the word is replaced. You can also choose to Add the word to the dictionary, Ignore, or choose the other options on the menu. It works with about 50 different languages including Korean, several Chinese, Hungarian, Hebrew, and Estonian. Wow. That’s it. Simple, easy to use, and brilliant. Now, there are no more excuses for mizzpelled words! Can you tell I’m happy, happy, happy? I understand that a lot of you have been having trouble installing Spellbound and finding the latest version. If you are still having trouble, let me know and I’ll try to track down more specific information. As a reminder, spell check is now comes built-in with the latest version of Firefox. So go get Firefox and change your Internet browsing forever. This entry was written by Lorelle VanFossen and posted on January 5, 2006 at 10:42 am and filed under Web Browsers, Web Wise, WordPress, WordPress Tips, Writing with tags how to use wordpress, wordpress, wordpress help, WordPress Tips, wordpress tutorials. Bookmark the permalink. Follow any comments here with the RSS feed for this post. Post a comment or leave a trackback: Trackback URL. IESpell is a very similar utility for Internet Explorer. Cool post. What version of Spellbound are you using? I’m using 0.7.3 in Firefox 1.5 for Windows and it does not do any real-time highlighting of words while I type. Instead I need to select the text then right-click and choose “Spellbound” from the popup. I end up with a clunky spellcheck dialog box that seems somewhat buggy when trying to spellcheck a long piece of text. In short, it doesn’t act anything like you described! I tried updating it and it says it’s the latest. I don’t know what I’m doing wrong. As a side note, I noticed the screenshot you included in your blog post was taken with Cleartype on. It’s probably best to turn Cleartype off before taking a screenshot. You can read more about what I’m talking about on my blog. BTW, great blog! I’m a fan! Today I just upgraded to Spellbound 0.9.8, so open your Extensions panel and run update to find the latest upgrade. And if you are having trouble, contact the extension author. Cleartype? Reality is that I sharpen and reduce the file size dramatically on my screenshots as I have little space with WordPress.com. I checked and Cleartype wasn’t on, but I did turn it on because I like having it on, so thanks for reminding me. I just got the laptop back from the shop with a brand new hard drive after somehow frying my old one. I’m still trying to put everything back on this thing. So thanks for the reminder. And great article and good point about screenshots. I’ve looked everywhere for Spellbound 0.9.8. Maybe the author pulled it? I couldn’t find it myself, but it appeared automatically on the Firefox Extension UPDATE. So install what you can find, restart Firefox, and then rup Update from the Extension window. See if the update appears there. If not, let me know and I’ll try to do more investigating. I’ll have to keep looking. I can’t find anything above version 0.7.3 even when I run updates in the extension manager. Interesting, I would love real time functionality, it appears that whoever authored that version pulled it. Oh well. Spellbound, the old version, is available for download from the Spellbound Sourceforge download site. That is version 0.7.3. I installed it and then closed Firefox, opened it, and then ran UPDATE. I got the new version. I did some more research and found out that the author hasn’t sent in his contract or contact information or some such thing which means that the latest version information isn’t updated on Sourceforge. Here are some links to help you find the latest version, I hope. I’ve been very today trying to find the latest version of Spellbound and it seems to be 0.7.3. I don’t where you got version 0.9.8. I tried updating the extension from the extension box, but couldn’t get anything better than 0.7.3. Some persons are having problems with Spellbound when they upgraded to Firefox 1.5.1.0. I’ve tried to help them out, but no joy. Are you aware of these recent problems? If you have a link for Spellbound 0.9.8. please let me know, because I’m anxious for a more recent version. I fully agree with you that Spellbound is the best (and only) speller for Firefox. I understand Firefox 2 will come with a speller integrated as part of the software. No extension will be needed. I have no connection or information about the author of the Spellbound Firefox Extension, other than being a fan. In the comment above and in the article I’ve included links to all the information I can find about Spellbound. All I know is that I installed 0.7.3 and than ran the update (after the required restarts of Firefox) and 0.9.8 is the version I’m working with. I’ll do more checking, but your best bet is to whine loudly in the Mozilla Extensions Forum to see if others may have more information. I’m so sorry because this is a brilliant tool and I wish people weren’t having so many problems with it. A problem I’m having now after being forced by Firefox’s auto update feature is that the red underline appears to indicate a misspelling, but the popup spelling suggestion box doesn’t appear any more. I have to right click and spell check the entire document. Painful, but tolerable in order to get spell checking through Firefox. there is an easy solution fro Spellbound lovers. I also have the latest version of Firefox (1.5.0.1) and had a compatibility problem with the spellbound extension. There is an extension called “Nightly Tester Tools 0.7.9.7” fixes the issue. and install Nightly Tester Tools. Restart your Firefox. Then go to: Tools>Extension. Now you will see a new button called “make all compatible”. Just click on that and restart firefox. I look forward to hearing from someone who has tried this. The Mozilla Extension Page, and even the home page of Nightly Tester Tools isn’t very helpful, but what I gather from the information is that you install this extension, restart Firefox, click Tools > Extensions and then you have two ways to use this extension. As Yalsta mentioned, on the Extensions panel is a button (next to FIND UPDATES) called MAKE ALL COMPATIBLE. Click that and hopefully all extensions that are “not compatible” with the latest version of Firefox will be “fixed” to make it work. It doesn’t work on everything and it is still in beta testing, but it might help with Spellbound. You can control the options for the program, options I don’t understand as there is no explanation or documentation I can find, just right click on Nightly Tester Tools in the Extensions menu and choose OPTIONS at the top of the right click menu. I’m not sure if Spellbound can be tweaked from there or not. Thanks, Yalsta, for giving us another option to get access to this great extension. People looking for the new versions, Robert (Spellbound’s author) is active on the Mozilla extensions forum and posted a thread with a new development version of Spellbound in early January. You can find an install link for the development version there which includes the spell as you go functionality. there are also major changes with this version, works like a charm. Ah, you haven’t finished reading the article. It does work. I got it to work. You just have to mess with it and follow the instructions in the links in the article and the comments to “force” it to get past the “not compatible” crap that Firefox offers. It works. I’m using it right now. Google toolbar has a spell-checker function too that works with web forms like wp’s write box. I hope I’m not repeating someone elses comment. Edward: I just updated to 1.5.0.2 this morning and Spellbound continues to work for me. Go through the article and the comments to follow the instructions to “force” Spellbound to work and it should work fine. Thanks for the heads up though. blagermeister: I’m glad people have a choice for spell check through toolbars, but I personally can’t stand them. They take up valuable screen space, eat up memory and slow down your whole computer as well as just the browser, and many do more than they advertise like monitor what you do on the web and collect and submit information to marketers. They are not always what they claim to be, so I avoid them totally. For those who don’t want to mess with the little complexities of installing Spellbound, until the author gets their act together and updates it, toolbars are another solution. Thanks for pointing it out. here i am just finding this post now (april 18) and excited about it too!